Carlyle Dental offers dental implants to residents living in Kinston, Goldsboro, Greenville and surrounding areas of North Carolina. Dental implants (also known as tooth implants) are a surgical method used to restore your smile. If you are missing one or more teeth, a dental implant will anchor replacement teeth into the gum line. Tooth implants are fused to the jawbone, which then act as a foundation for replacement teeth, crowns, bridges, or over-dentures. The result is a natural-looking smile with no gaps. Different types of dental implants are available, and can be a superior choice when compared to alternatives such as removable dentures or bridges. Implants offer a greater level of comfort and reliability for speaking, chewing and smiling. Missing teeth can cause numerous dental problems. The remaining teeth may shift, affecting the bite and lead to further tooth loss or gum disease. The underlying structures of the teeth and gums can begin to deteriorate. Dental implants are an effective way to replace the missing tooth while maintaining the integrity of the surrounding tissue. If you live in Kinston, Greenville, or the surrounding area of North Carolina and have missing teeth, contact us at Carlyle Dental to see if you may be a good candidate for dental implants. Dental implants can improve the health and appearance of patients who are concerned with missing or broken teeth. They can restore your ability to eat certain foods, vastly improve your smile and, your self-confidence. Dental implants are helpful in maintaining healthy dental hygiene. Prior to dental implant surgery, a comprehensive consultation will be performed to determine the necessary type of implant and its placement. The types of dental implants will either be endosteal, which is placed into the bone, or subperiosteal, which is placed onto the bone. The implant anchor is surgically implanted into the jaw, and the bone is given several weeks to fuse around the implant. 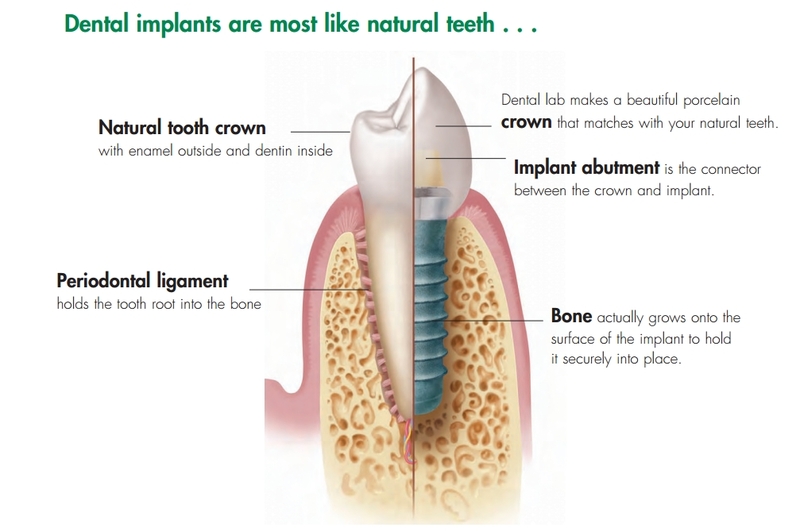 Once the implant has taken adheres, an artificial tooth can be created and fitted. No grinding of healthy teeth is required, and your natural teeth remain unaffected. Dental implants serve as a support for dental prosthetics such as crowns, bridges, and dentures. A custom-crafted appearance that looks and feels like natural teeth will be the optimum result. With good oral care and regular checkups, your dental implants can last for many years, even a lifetime. The benefits of implant dentistry are not only cosmetic, but also contribute to improved overall dental health. How Much do Dental Implants Cost in North Carolina? The cost of dental implants varies depending on the extent of treatment necessary. We accept cash, MasterCard, Visa, and personal checks. Insurance is accepted, and we also offer financing through CareCredit® and Compassionate Healthcare Services®. Is it Possible to Use Medical Insurance if I Don’t Have Dental Insurance? Yes, if you don’t have dental insurance you still have financing options at Carlyle Dental. Dr. Carlyle is one of the only dentists in North Carolina who works with medical insurance companies and in many instances we can use your medical insurance to cover the cost of your dental implant treatment. Why Choose Carlyle Dental for Dental Implants?